A member of the Markplex.com email list requested that I demonstrate a way of being able to plot both volume and tick data on a chart, simultaneously. This tutorial demonstrates how to use Price Series Provider to plot both volume and ticks on a chart. This new capability became available when TradeStation 9.0 was released. Previously user had to change the settings of the instrument they were using to use either volume or ticks (Format – Symbol For Volume use:...). 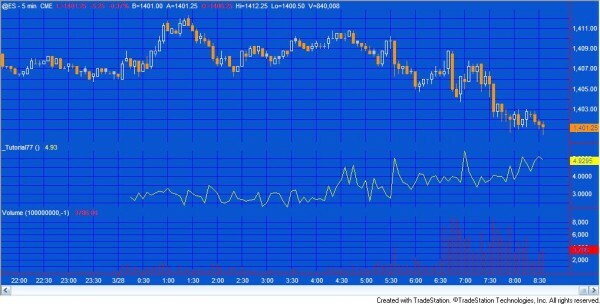 Using a price series provider means that it is possible to see both volume and tick data. In the tutorial I plot both the and ticks with the indicator created for this tutorial. I compare the values with those plotted using the TradeStation Volume indicator with the two different volume settings (I explain this in more detail in the video). As always, Gold Pass members are eligible for a 20% discount off this price. If you are a Gold Pass member you can get the current discount code here.